Lately I have become an expert in rescuing failed cakes or using extras. I recently visited Kulinarijat, a beautiful new restaurant in Zagreb, which offers sweets and cake pops so I thought of them – otherwise they yould not be the first idea that comes to my mind. I just happened to have some excess sponge that I decided to take advantage of, and I also needed a small gift for my best girl friends. We don’t see each other very often and I miss them, so sometimes I like to surprise them. Rarely, unfortunately. Preheat the oven to 180 ° C, and line a small pan with parchment paper. Mix the eggs and sugar well until they are foamy, then add the flour and baking powder and stir. Pour in the tin and bake 8-10 minutes. It's done when a toothpick stuck into the middle comes out clean. Remove from the pan and remove the paper, cool and cut into small pieces. Grind in a blender. Bake the nuts in a dry frying pan, rub with a cloth to remove the skin and grind. Heat the cream almost to a boil and pour over chopped chocolate. Stir until all the chocolate is melted. Cool about 30 minutes, and when the cream starts to squeeze, mix it to get a mousse. Add the sugar and nuts and stir. Stir the grinded sponge into the cream and make balls the size of golf balls or smaller. Melt the dark chocolate in the microwave. 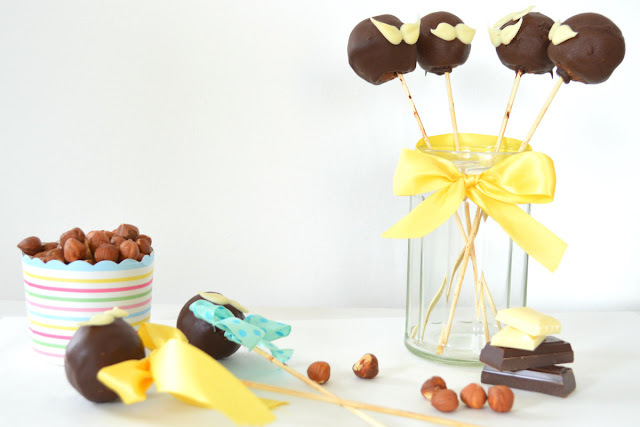 Coat the top of your stick with dark chocolate and place in a glass with the top up to squeeze. When squeezed, stick the pops on top. 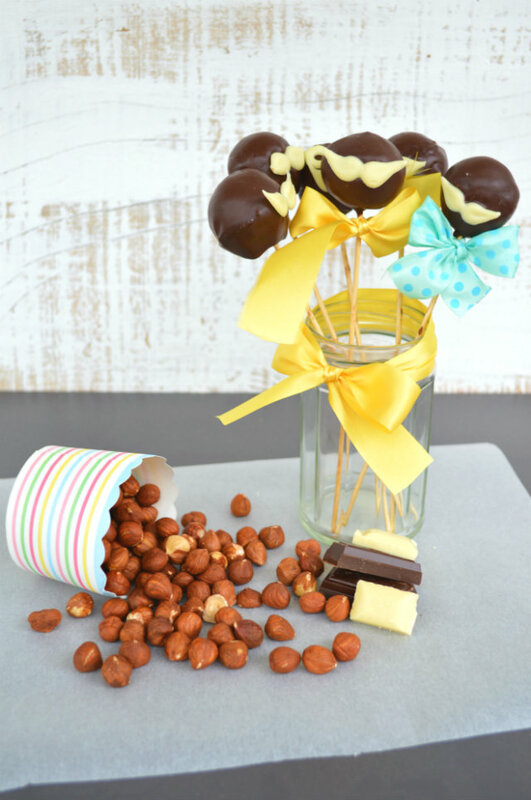 Dive each pop into melted dark chocolate, get rid of the excess chocolate and arrange in a glass so that the pops do not touch. When the chocolate begins to squeeze, carefully place the mustache with tweezers or similar small gripper. They should not fall, two chocolates will squeeze together tightly and the mustache will stay in their place. Refrigerate until they are cooled. Finely chop white chocolate, put in a freezer bag, push into a corner, and tie the other three corners together. Put the bag in hot water to melt the chocolate in the bag. When melted, wipe the bag and cut a very small piece of the corner. Get a baking sheet and squeeze out small dots (about 0.5 cm in diameter), so that two are close together. 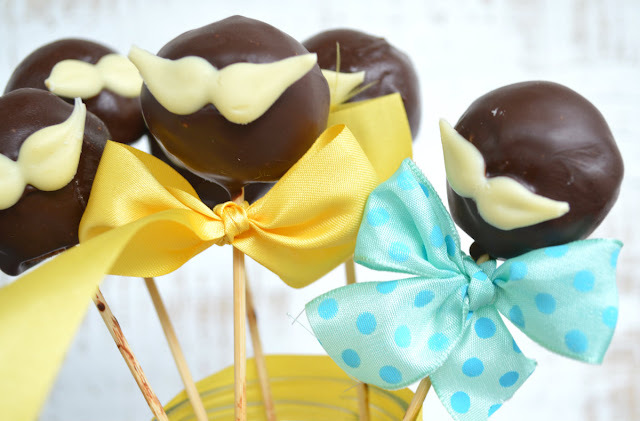 Using a toothpick, make mustache shapes on each side of the chocolate dots and connect two dots in the center. And do this 15 times :) Put in a refrigerator or freezer until the chocolate is squeezed.